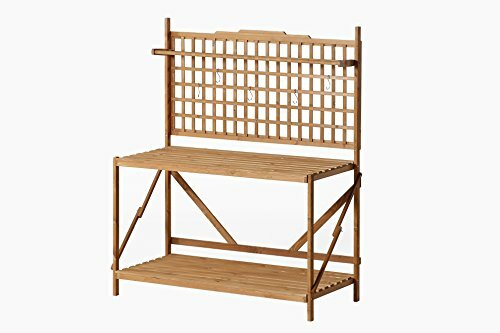 The Patio Wise PWLPT-008 Large Potting Table with Hanging Rack is a unique outdoor table for gardening and home projects. Constructed from durable and weather-resistant fir wood, this large potting table provides a strong and reliable table for all your outdoor needs. Garden from a standing position rather than in the dirt with the Patio Wise Large Potting Table with Hanging Rack. Hang baskets from the towel bar, access hanging tools from the lattice back (hooks included), and utilize the full-sized storage shelf below for soil, pots, and watering cans. Not just for gardening, the large surface area functions nicely for parties or grilling out and folds easily for storage. The table measures 48-inches long, 24-inches wide, and 60 1/4-inches high. The Patio Wise Large Potting Table has a 1 year warranty. Patio Wise is dedicated to providing our clients with top quality products and service at an unmatched level with the guarantee to meet quality expectations. If you have any questions about this product by Patio Wise, contact us by completing and submitting the form below. If you are looking for a specif part number, please include it with your message.